Near the Tuckamore Lodge in Newfoundland, Canada, fishing is a great outdoor activity where you can catch a handful of Speckled Trout. 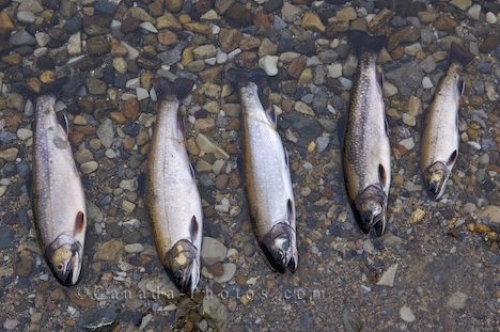 A line of Speckled Trout lay along the shallow shoreline that were caught during the day by fishermen staying at the Tuckamore Lodge near Main Brook, Newfoundland. There is an abundance of Speckled Trout in the river and days spent along the river fly fishing are usually a success. Speckled Trout, caught from near Tuckamore Lodge, Main Brook, Highway 432, Viking Trail, Trails to the Vikings, Great Northern Peninsula, Northern Peninsula, Newfoundland, Canada. Picture of Speckled Trout caught while fishing in the river near the Tuckamore Lodge in Newfoundland, Canada.